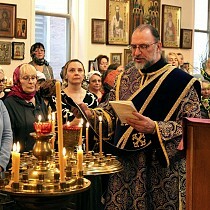 On February 24, the Sunday of the Prodigal Son, Metropolitan Hilarion of Eastern America & New York celebrated Divine Liturgy in the Synodal Cathedral of the Sign in New York City, concelebrated by diocesan vicar Bishop Nicholas of Manhattan and cathedral clergy: senior priest Archpriest Andrei Sommer, Archpriest Edward Chervinsky, Protodeacon Nicolas Mokhoff, and Deacon Pavel Roudenko, as well as Abbot Eutychius (Dovganyuk; cleric of St. Gregory the Theologian Church in New York City). Singing at the services was the Synodal choir under the direction of conductor Peter Fekula. That morning saw a significantly more worshippers in the cathedral than usual, as many had come to honor the memory and pray for the repose of the soul of the cathedral’s long-time warden, Prince Vladimir Kirillovich Galitzine, who had departed to the Lord one year prior. 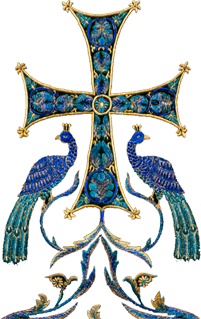 In his sermon upon completion of Liturgy, Metropolitan Hilarion called Galitzine a remarkable warden, who loved the Church and the Synodal cathedral, and called on all those present to pray for his soul. His Eminence also wished for the faithful to face the coming weeks of Great Lent with joy, tenderness, and a feeling of their sinfulness and of repentance, in order to receive the great feast of Holy Pascha with a feeling of reconciliation to the Savior and of Heavenly joy. Metropolitan Hilarion and Bishop Nicholas served a panihida for the repose of the ever-memorable Prince Vladimir, upon completion of which a memorial repast was served in the cathedral hall.